Suite Sports: MIAA Football:Thanksgiving Football Picks! Happy Thanksgiving one and all! Throughout the state on Wednesday night and into Thursday morning, some of the state's most storied rivalries will commence. Folks from across Massachusetts, including family, friends, and alumni will bundle up and make their way to their local high school football field to take in one of the top annual high school traditions. Four teams have the special opportunity to play at Fenway Park as part of the Gridiron Series. Last night, Burke took down West Roxbury while Foxboro defeated Mansfield in an instant classic, 35-33, that lasted three overtimes. Tonight, meanwhile, St. John's Prep and Xaverian will play for the Catholic Conference title before Natick and Framingham finish off the two day affair. For the 100th time, East Boston and South Boston will go head-to-head with kick-off scheduled for 9:30am on Thursday morning. In one of the more notorious Thanksgiving Day rivalries in the country Needham and Wellesley will play for the 128th time. Wellesley leads the all-time season series 62-59-6. The annual battle of the Lynn schools will take place at Manning Field with Lynn English holding a 55-40-2 all-time series lead over Lynn Classical. Quincy and North Quincy will play in front of an expected capacity crowd at Veterans Stadium. In one of the top clashes in the state, Attleboro and North Attleboro will fight for supremacy in a battle of the border. The matchup features two of the top linemen in the state in Attleboro's Nick Evans and North's Ryan Clemente. Out in Central Mass., Wachusett and Shrewsbury will play for the Mid-Wach A league title. Nipmuc and Blackstone Valley have the rare opportunity of playing each other on Thanksgiving before both head to Gillette for a Super Bowl. Now, for our holiday picks! Feld's Pick: St. John's Prep is the best team in the state, and I expect them to add a Catholic Conference title to their resume against a banged up Xaverian team heading into its Super bowl showdown with Catholic Memorial. Parello's Pick: Xaverian is playing for pride, while the Prep still has Gillette next week... But I can't pick against the Eagles, given the way they've played of late. Feld's Pick: This is one of the top games on the slate this week, both due to depth of talent and because of a league title hanging in balance. Drew Campanale caps off his terrific career with a Mid-Wach title. Parello's Pick: Plenty of Mid-Wach bragging rights will be on the line in this one, so I'll go with the Colonials, though Wachusett has flat-out looked dominant at times. Feld's Pick: North Attleboro gets the better of their rivals with Nick Raneri and Ryan Clemente finishing their careers in style. Parello's Pick: NA gets a big win to send a historic senior class off in style. Feld's Pick: This is one of the better games on the menu as it features two of the state's best quarterbacks. Matt Severance has been one of the more under the radar players in Massachusetts this season. In his fourth start in the series, he emerges with his third victory. Parello's Pick: The Battle of Lynn should be a close one either way, but I'll roll with Classical in a classic. 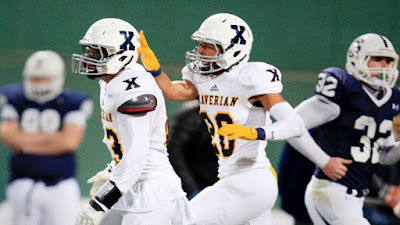 Feld's Pick: Franklin came up just short in its effort to take down Xaverian, so for them this is their Super Bowl. They have not beaten King Philip in nine years, including a 35-14 defeat earlier this season. The Warriors are preparing for the super bowl, and Franklin is hungry for a program defining victory. Nick Gordon and co. change their fortunes and finish one of their best seasons in recent years with a big Thanksgiving Day win. Parello's Pick: Much like with SJP, I think King Philip will go all out to win on Thanksgiving and carry that momentum to Gillette. Franklin will give the Warriors all they can handle, but KP ultimately comes out on top. Feld's Pick: Matt Petercuskie continues his family's tradition of football on Thanksgiving with a win giving Barnstable an Old Colony League title. Parello's Pick: A great Cape rivalry continues with the Clippers bouncing back and ending their once-promising season on a very high note. Feld's Pick: It's been quite the season for Scituate, who may be well on their way to celebrating their first Super Bowl victory in school history. Hingham, however, has had one of their best seasons in program history with its only two losses coming at the hands of Duxbury. It goes down to the wire, but the Harbormen get victory number eight to close the season. Parello's Pick: I guess I'll continue my trend of betting on the team playing at Gillette, hoping they will play their starters and actually look to win. Scituate has been an amazing story, and I expect it to keep that momentum going. Feld's Pick: Needham may have fallen to a very talented Catholic Memorial unit, but this Rockets team is still special. Charlie Ogletree and Matt Smith have helped start a new era of Needham football, and they cap it off in style. Parello's Pick: Needham's high-powered offense gets revved up one more time to deliver a Turkey Day win. Feld's Pick: One of the more unique Thanksgiving Day matchups in recent years with both teams heading to Gillette next week. Both teams have been on fire over the last eight weeks, but give me Nipmuc in a great clash. Parello's Pick: Well, there goes my "bet on the team going to Gillette" strategy... The Battle for Pleasant Street should still be a hard-hitting affair, but I'll roll with J.D. Antaya and the Beavers. Feld's Pick: It's always a good one when these two teams meet, and despite BC High's recent dominance in this rivalry, Catholic Memorial is the superior team playing its best football of the season at the right time. Parello's Pick: This CM team took several big steps forward this year, and a win over its Thanksgiving rival will keep that momentum going towards Gillette next week and beyond.